Obama promises to continue working "to address the crisis around the world"
WASHINGTON (CNN) -- President-elect Barack Obama doesn't often offer praise for President George W. Bush's foreign policy, but on Monday he offered the outgoing head of state accolades for battling AIDS in Africa. 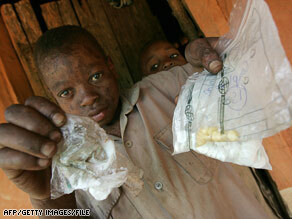 Zimbabwean orphan Evans Mahlangu shows the free medicine he got by walking to Mozambique in February. "I salute President Bush for his leadership in crafting a plan for AIDS relief in Africa and backing it up with funding dedicated to saving lives and preventing the spread of the disease," Obama said in taped remarks to the Saddleback Civil Forum on Global Health. The videotape was played during a forum marking the 20th anniversary of World AIDS Day, established by the World Health Organization to raise awareness about the disease. Under the Bush administration, more than 2 million people infected with HIV -- most of them in Africa -- have received lifesaving anti-retroviral treatment as part of the President's Emergency Plan for AIDS Relief, or PEPFAR. Obama promised to continue working "to address the crisis around the world." Obama's compliment was one in a series of paeans offered via videotape by world leaders to Bush, who will step down in January after two terms in the Oval Office. "President Bush's efforts have saved literally millions of lives," said former British Prime Minister Tony Blair. President Paul Kagame said Rwanda was much better off because of Bush's dedication to improving global health, and U.N. Secretary-General Ban Ki-moon congratulated Bush on "his legacy of leadership." "The president's emergency plan for AIDS relief has made it possible for people in countries hardest hit by the disease to receive treatment," the U.N. chief said. Afterward, first lady Laura Bush said, "That's sweet, so sweet." "I insisted upon measurable goals because I felt that lives needed to be saved," he said. "And if you don't have measurable goals, lives might not be saved." Even with Bush's effort, WHO reports that only 31 percent of people in low- to middle-income countries who needed treatment received it last year, and the number of new cases is increasing 2.7 times faster than the number of new people getting treatment. The U.S. Centers for Disease Control first brought AIDS to the public's attention in 1981 when it published a report about five gay men who had become sick with a rare form of pneumonia linked to depressed immunity. In a statement posted on the organization's Web site, WHO Director-General Dr. Margaret Chan called AIDS "the most challenging and probably the most devastating infectious disease humanity has ever had to face." "We must ensure that the current unprecedented rollout of treatment reaches more people and is fully sustainable. Stepping back or slowing down on treatment is not an acceptable option on ethical and humanitarian grounds," Chan said.